I touched down at O'Hare with two phones in my purse. That's how I roll these days: my spiffy work iPhone and my old scuffed andriod with no data plan, jostling each other, jockeying for space in a purse that was never meant to carry more than a slim credit card sleeve. It's only been three weeks, but I've accustomed myself to this life, to trying to remember to charge not one but two devices, to the different beeps and tweets and hiccups and burps, like two children. On the train towards downtown, I texted from my android with Kathy from Bereaved and Blessed, who managed to pick up my BlogHer conference pass and bag by showing them my texts in real time. Then I swapped phones, replying to a few more work email messages that had come in since I'd landed, swaying, becoming more accurate with my pointer-finger aim. By Thursday night I conceded: it would be easier to manage the conference by downloading Facebook and Twitter to my work phone. And I would eventually use them for work anyway, wouldn't I? The conference app was easier to manage from my iPhone, too. But I could delete that later. Besides, that was how I'd gotten here, two and a half weeks into a new job: my supervisor generously reassured me that I would be learning things that would apply to work. And so began the blurring of boundaries, personal and professional, work responsibilities, and responsibilities to myself. On Thursday before bed I pored over the conference program, trying to balance participation in sessions I imagined I should attend "for work," versus the sessions I really wanted to attend. They were definitely different things: I found myself circling the writing track, but thought that for work, the marketing and technology tracks would probably be more important. (Part of my job entails helping students with their writing, but I conveniently decided that was not applicable. This becomes important later.) I bookmarked several sessions in each breakout, figuring that maybe I could session-hop a little, and satisfy all of the responsibilities I thought I had. On Friday, I juggled the two phones and my laptop, trying to keep up with the conference tweet stream (which, by then, was trending nationally), respond to student email and do work things, and touch base with my blogging friends so we could find each other for meals. By late afternoon, as I rode down the escalator, watching some of my favorite bloggers go to the sessions that I'd sort of wanted to attend, too, I became acutely aware of trying to do two things at the same time, and doing neither of them particularly well. Working parents in the audience ... sound familiar? I session-hopped, trying to get as much as I could of everything. Or maybe more of the social media and marketing skills than the essay and memoir writing. And finally, on that last day, before the lights dimmed for the introduction of Gale Anne Hurd, I broke. Maybe it was the leave-taking, saying good bye to the bloggers who continue to seek out my work and encourage me to write, even when I don't post anything consistently for weeks. Maybe it was sleep deprivation, even though I didn't go to a single late-night party. Or maybe it really was the realization that I am first and foremost a writer, and the fear that I'd been given an opportunity to interact with some of the most talented writers I know, and I'd squandered it. Depending on the path my life takes, I may not be able to go to BlogHer again for a long, long time. I felt ridiculous, because I'd tried to imagine what my supervisor would want, knowing that she didn't actually have any expectations of me, that she trusted me to go learn something useful. I tried to shove aside the thoughts that I'd done myself a disservice, that somehow I'd cheated myself, for no reason at all. Don't get me wrong. BlogHer '13 was wonderful, just at BlogHer '12 was wonderful. I spent some intense connection time with bloggers I love and admire, people whom I count among my dearest friends. I got to attend some inspiring writing sessions. I got to sit right there with Sheryl Sandberg and Guy Kawasaki and Ree Drummond and Randi Zuckerberg. I brought home some cool swag for my kids, who love pens and flashlights and stickers (anything else is icing on the cake). But most of all, I was reminded that I am a writer, and that I need to be true to my heart; whether that means really not worrying about marketing and monetizing my blog, or quantifying my success by the number of followers I have, or by being gentle enough with myself to allow myself to write the crap that needs to come first before I produce something really good. As I boarded the plane on Saturday, I powered down. Just me, and my pen, and a pad of paper. Because sometimes, two cell phones is two too many. "You look ... happy," she says to me, sizing me up one last time before she heads home. My friend, who had come to see my new office, is standing in the middle of the walkway, framed by the contrast of modern and Collegiate Gothic architecture, dappled light playing on the walkway around her. "I'm ..." I begin, trying to find the words, "it's complicated ..." I hesitate again, a little bit surprised at what I'm about to say. "... I guess I am happy." It's a thought that's crossed my mind more than once during my drive home from work over the Sourland Mountain and down into the valley, as I take stock of my day and plot the next one, passing fields of grazing cows. I try this "happy" on in the car, like a hat, adjusting it this way and that. Am I really? What if I think about it this way? Isn't it complicated? Happy is word I dare not use. How could I be happy to leave my children, getting home barely in time for dinner, spending so much time away from them? What kind of a parent is happy that way? And how could I be happy making just a little more than the cost of day care, and probably breaking even after I add in clothes and a commute? How could I be happy having to rebuild my career from the ground up? What kind of self-respecting professional could be happy with that? And yet, that's exactly what it is. In the years to come, I will likely count going back to work as one of the hardest decisions I've made, next to leaving. I need to work for financial reasons. I couldn't have stayed home forever anyway. But transitions are always difficult, aren't they? Deciding to move across the country for graduate school. Deciding to leave said graduate program, giving up two years of fellowship money because the program didn't "feel" right. Deciding to move back across the country to my parents' basement and take a job at my alma mater. Deciding to leave the job at my alma mater, because I felt like I was worth more than the way I was treated. And now, deciding to take this position. But as I drove home the other day, the thought entered my mind, unsolicited, and crystallized: yes. This is right for me. It's not often I get moments of complete clarity. In that moment, wearing my work clothes, driving in my stockinged feet, heels kicked off to the side, I felt like my identity and my work were aligned again. I am a parent who works outside the home, I said to myself. I wonder if it would have been this clear to me if I hadn't ended up staying home for a while. After all, being at work was all I'd ever known. But seeing it from the other perspective, knowing that I am capable of staying home, but that I'm in a better place when I am not at home, and when my children and I go our separate ways, reconnecting at the end of the day, has helped me to appreciate who I really am. And I can accept that it might change, but that for now, this is where I need to be. It's not easy. Getting a second grader and a toddler out the door by 7:15 is no picnic, nor is a long commute that gets me home at 6. In order to make this work for me and for my family, and have enough time to spend with them when I am home, I have given up pretty much all of my extracurricular activities. No more yoga or other exercise right now. No more volunteer commitments at night. And there are certainly other sacrifices: last night, as I stood making my kids' lunches after dinner, I thought, yes, this is the way it will be, every day, ad infinitum, until they go to college. Studying my son's award from day camp, I thought about how brave he is to be alone, how independent he is, despite the fact that we still can't trust him to wash behind his ears. And my daughter is a little clingy when I walk through the door at 6pm, but she is also excited to see me, to tell me her stories, which mitigates the clingy a bit. It's not perfect. There will be hiccups, adjustments. But yes, I think, this is right. And finally, isn't that, with all of its flaws and imperfections, what happy is? When I was little, there were umbrellas. Mostly I remember my father's black umbrella, the black one with the faux leather handle that smelled like his car. My mother must have had one, maybe light blue. And there were extras, of course, in case your assigned umbrella couldn't be found. I must have had a rain jacket, too, though I also remember my mother saying something about how plastic rain jackets just make you sweaty, so perhaps not. I know I pined away for a shiny purple jacket and matching boots, like the ones that Robyn Kelleher wore. Still, even if I had said boots and jacket, I was taught that you carried an umbrella when the forecast called for rain; we weren't like those people we saw running or even walking down the street, their white Keds oozing water at every step. Rain smelled like fear: you could get sick, being out in the elements, getting your head wet. So, like our parents, we protected ourselves, joined the ranks of umbrella-wielding adults. My brother, conformist that he is, even asked for a new one last Christmas. I don't know when it started, but some time ago I began to bend this rule, little by little, letting myself be rained on. For a while, I carried the umbrella, but I resisted opening it in a light drizzle, as long as I was wearing something I didn't care much about. Soon, I was throwing caution to the wind when the forecast was uncertain: sometimes I'd carry the umbrella, sometimes not. Sometimes, I'd leave it behind on purpose, as long as it wasn't currently raining when I left the house or my car. And finally, I began to walk--and later, even run--in the rain, knowing full well that I was going to get wet. It was an act of resistance, or perhaps even defiance, this refusing the protection of my umbrella. On Friday, at around noon, the skies began to darken, and from my window, I could see spots where the raindrops had started to pattern the pavement. I shoved the umbrella into my bag before I locked the door to leave for my meeting; I was wearing the newly-tailored suit and a pair of heels, and I didn't want to take chances, especially given that I knew it was supposed to pour. I was thankful for the umbrella later, when I found myself navigating the monsoon from my office to the parking garage. I stepped gingerly around puddles, trying to hold my suit up out of the wet mess, knowing that it was probably fruitless. Driving north towards the CSA pickup and home, I mentally rehearsed the week's share. Eggplant, zucchini, potatoes, peppers, scallions, beets ... and beans. Which, if I wanted them, I would have to pick myself, in the rain, which continued to fall steadily. There were few places to park in the field that weren't riddled with mud holes, and by the time I turned off the car, I was having doubts about the beans. I left my umbrella behind, on purpose. It would be a quick trip. But when I got to the CSA distribution center, I realized that the zucchini and eggplant were already gone (that's what I get for working and agreeing to an hour commute, I guess). And there are only so many carrots one family can eat. Fleetingly, I considered the umbrella. I'll just be a minute, I thought. And I need my hands for other things: one to pick, one to hold the bag. Plastic bag perched atop my head, I slogged up the hill to the far field, where the bean plants sagged under the weight of the storm and the ripe beans. As I began working my way down the row, lifting the leaves gently and tugging at the fruit, lifting and tugging again, I felt the back of my shirt start to glue itself to my skin. Then my shorts, to my thighs. The mud had already made its way over the top of my shoes, and was working itself into the soles of my feet. Bent, head toward the ground, I felt the rain trickling down my hair and neck, and tasted it running into my mouth, wiped it away from my eyes. My body began to melt away into the earth and sky; there were only the bean plants, and the rain. In some ways, giving up the umbrella was like giving up protection. But in other ways, it was giving up the boundary, giving up fear. It was only water. I'd dry off. Have you ever tried to protect yourself, only later realizing that the very thing protecting you was preventing you from being present, or from feeling something that changed you? And do you use umbrellas, or are you a "run between the drops" kind of person? Yesterday, my friend Kathy hosted her monthly Time Warp Tuesday blog hop. I missed the hop, but I loved the theme for this month, which was Advice. I tend to give a lot of advice, I suspect, not even under the guise of opinion; I probably offer it up as fact. Though I was trained in advising, and when I'm working with students I'm careful not to give advice so much as facilitate their own inner dialogue, there are plenty of times outside of my professional duties when I offer up my own ideas about someone else's dilemmas. I ask for advice a lot, too, but I don't take advice very well; more often than not I am--even subconsciously--looking for verification of an opinion I've already arrived at, and would like confirmation of my choice. But the tables were turned on me a bit this week, on Sunday, when I was sitting with my son for a while before he went to sleep. "I'm nervous about my first day," I confided. "It's OK, Mom," he told me, "I was nervous about my first day of school, too." "You were?" I asked, both amused and genuinely surprised. "But you looked so confident when you waved good bye to me on the bus. What were you most nervous about? Meeting new people? Having someone ask you something you didn't know the answer to?" "Yes, not knowing the answer," he agreed. "Well, that's what I'm most afraid of," I said. "That I won't know the things they want me to know." "Well," he said, thoughtfully, "just remember, that if they ask you something you don't know, it's OK to tell them you don't know, and then ask them questions, so they can help you out." Wow, I thought. Pretty fabulous advice for a six year old. Better, even, than "eat your vegetables so you can grow up big and strong." I followed his advice, and told my new boss what he'd told me that night. "How old did you say he was?" she asked. "He is wise beyond his years," she marveled. Yes, I agreed. Except when he really does act like a six year old, and thinks that poop jokes are the funniest thing ever. And I couldn't be more grateful for both elements. Eat your vegetables and grow up big and strong. I made these with our CSA share to take to the Cape for the week we spent before my first day, and I told everyone right up front that they were made with beets. That didn't seem to matter, and they were gone in less than two days. Preheat oven to 425 degrees. Wrap beets in foil. Place on a baking sheet; bake until beets are slightly soft to the touch, 45 minutes to 1 hour depending on their size. Cool beets in packets, then rub off skins under cold running water (use a paring knife for tough spots). Puree one at a time until you get 1 c. (you can set aside the unpureed parts, if there are any, for a salad). Cool completely. Preheat oven to 375 degrees. Line a 12-cup muffin tin; set aside. In a large bowl, whisk together the flours, baking powder, baking soda, salt, and flax until well combined. Stir in the half cup chocolate chips; set aside. In a small saucepan, melt the other 2/3 cup chocolate chips and butter over very low heat. Stir to combine and set aside to cool until lukewarm. In a medium bowl, whisk together eggs, brown sugar, beet puree, buttermilk, vanilla and melted chocolate. Pour the chocolate mixture into the dry ingredients and stir with a wooden spoon until just combined. Don’t overmix. Immediately spoon batter into prepared muffin cups. The batter will almost completely fill the cups. 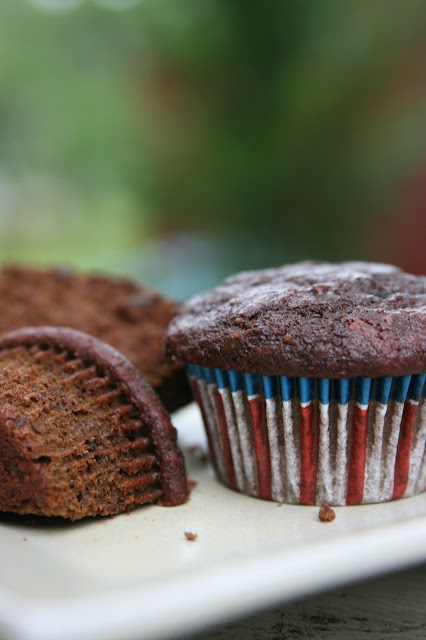 Place muffin pan in a preheated 375 oven and bake for 18-20 minutes. Muffins are done when they spring back when touched lightly in the center (or when a toothpick inserted in the center of a muffin comes out clean). Cool muffins for 10 minutes in pan then remove them to a wire rack to cool completely. In preparation for my first week of work, I bought four completely new (non-consignment) pieces of clothing for my professional wardrobe: a cami, a pair of black heels, a drape jersey sweater, and a beige Anne Klein pantsuit. I hate paying full price for clothes, for a few reasons: (1) it's very expensive to buy women's clothes and I'm thrifty (this is probably putting it politely), (2) there are plenty of clothes out there in circulation without me purchasing additional sweatshop-produced landfill-destined products, and (3) I second guess every piece of clothing I buy, wondering if it actually looks good on me or not, so buying on consignment at least allows me to feel less guilty if clothing ends up hiding in my closet. I've always prided myself on my resistance to conspicuous consumption: I don't own many clothes, and I own about four pair of shoes. Given this information, you can imagine me at the register, handing over my credit card to pay for a new pantsuit at Macy's. Which, by the way, didn't fit exactly right. And which I brought to the tailor yesterday to get altered. Alterations scare me even more than buying clothes. Because when you're buying clothes, you can always return them. You have a grace period. You can just refrain from removing the tags, and you're safe. 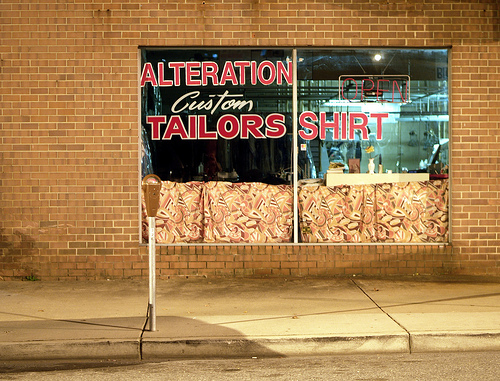 But alternations? That is commitment. No more second chances. No more changing your mind. You and this pantsuit? Are practically married. The tailor, who is a little old Korean lady at the dry cleaners who doesn't speak very much English, tugged at my waist. "OK?" she asked. "A little less," I suggested, sucking in my gut for a minute before letting it out again, knowing that having a little extra room would probably be a good idea. Just in case. My son looked up from the revolving chair at the sewing table, where he sat patiently reading his book, waiting for me. He raised his eyebrows. Wiseass, I thought. She pinned. "And hem?" she asked. "Yes," I said, looking down at my pants legs dragging on the floor. "Please." She held up the hem. "I don't know how high shoes," she commented, shaking her head. Of course I wasn't wearing high heels at the time; sneakers have been a safer choice for me since I sprained my ankle, and I am still feeling a little gun-shy. "I don't know how high they are, either," I admitted, not telling her that I don't even know what shoes I could wear with this suit. "Here?" she said. No, a little more. "Here?" She was beginning to lose her patience with me. "Maybe this isn't right after all," I said, frowning, beginning to worry that maybe I should just return this suit and skip the stress and cost of alterations altogether. I pulled at the waist, where the pants bunched a little from the crotch. "But the jacket could cover it up?" "Here," she said, no longer asking, pinning the hem decisively. She shrugged, sizing me up. "Is OK." In other words: get over yourself and get down off my box so I can start working on these. She handed me a slip. "Next Thursday pick up, OK? OK."
I felt a little bit like I'd been bullied, but I guess I deserved it. She was completely confident about her work. She wasn't being paid to offer me an opinion about my clothes selection; she was being paid to tuck and hem. And she wasn't even being paid yet. I, on the other hand, was being completely wishy-washy. At the tailor. The thing is, when you bring something for alterations, you have to commit. No looking back. You'll have to live with it. And if you need a new pair of pants in the end after all, maybe it's not the end of the world.